Chocolate and orange. To me, it's a wonderful combination. I've probably said it before but I'll say it again. I love shortbread cookies! It's such a blank canvas to which just about any flavors can be added. I've made some unusual combos like basil and lime ( which I still get requests for). And speaking of requests, the reason I made these cookies this week is that a woman...a very patient woman, I might add.. from the farmer's market, has been asking me to make them for her. I promised her last week I'd bring her some, so here they are! 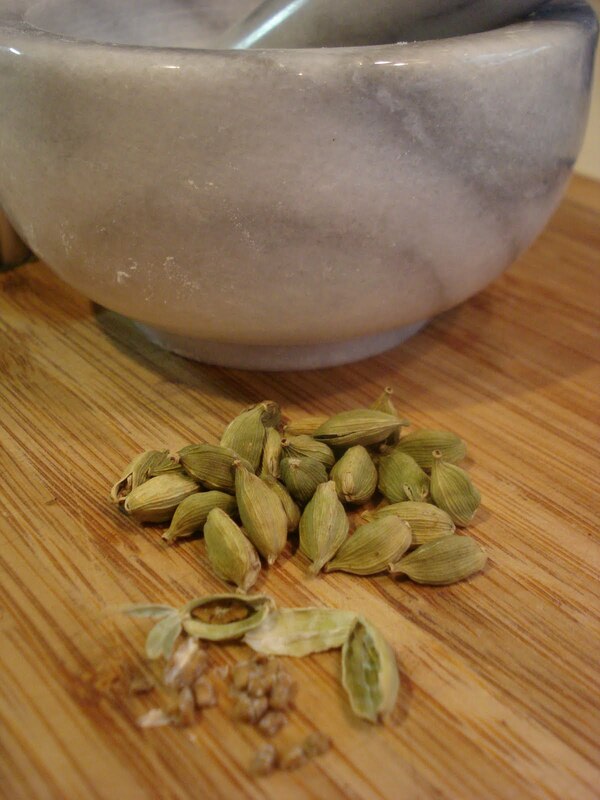 I love the intense flavor of buying cardamom pods and using them as I need it. If you don't want to go to the trouble of this, or you can't find the pods, then just buy the ground cardamom in the spice section of your market. 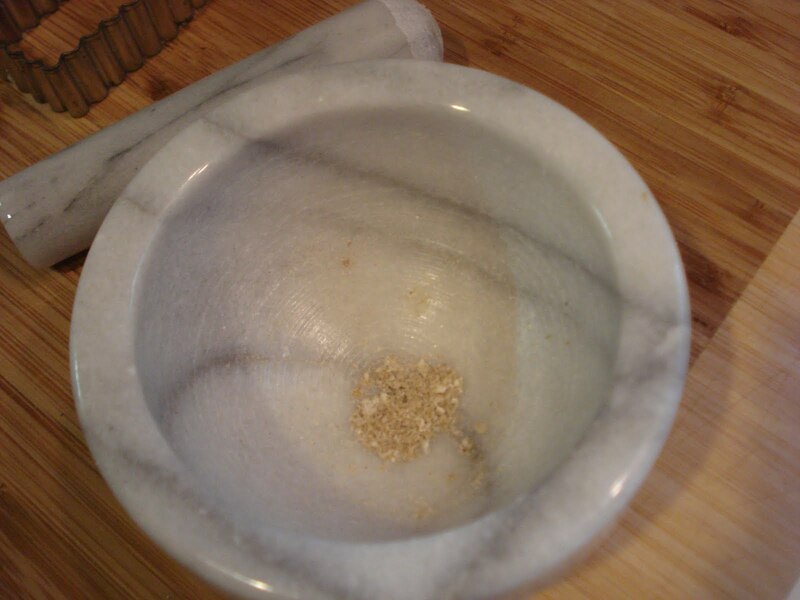 I use a mortar and pestle to grind them. 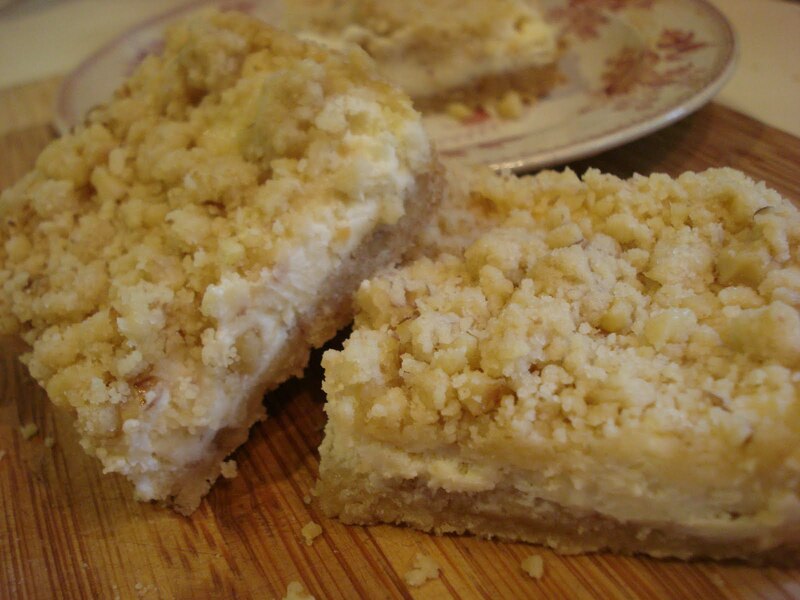 Put the confectioners' sugar in a mixing bowl with the butter and beat this til combined. 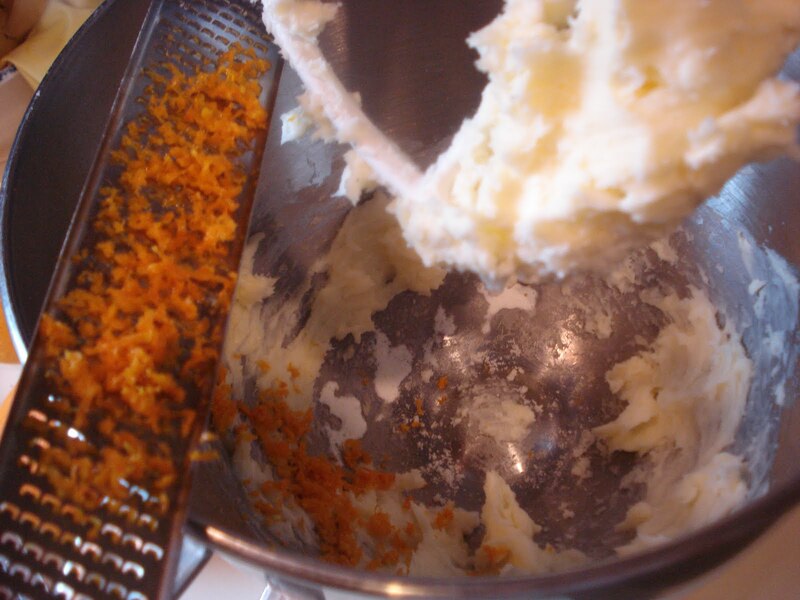 Then add all the orange zest for a wonderful orange flavor. Add in the dry ingredients and beat together til it's all well combined. Dump the dough onto a piece of plastic wrap and form it into a disc with your hands, trying for a rectangular shape, if you're using a rectangle or square cutter. If you're using a round cutter, then make it into more if a round shape. Place another piece of plastic wrap over top and roll out the dough to between 1/4" and 3/8" thickness. Then place in the fridge to get nice and cold and hard. 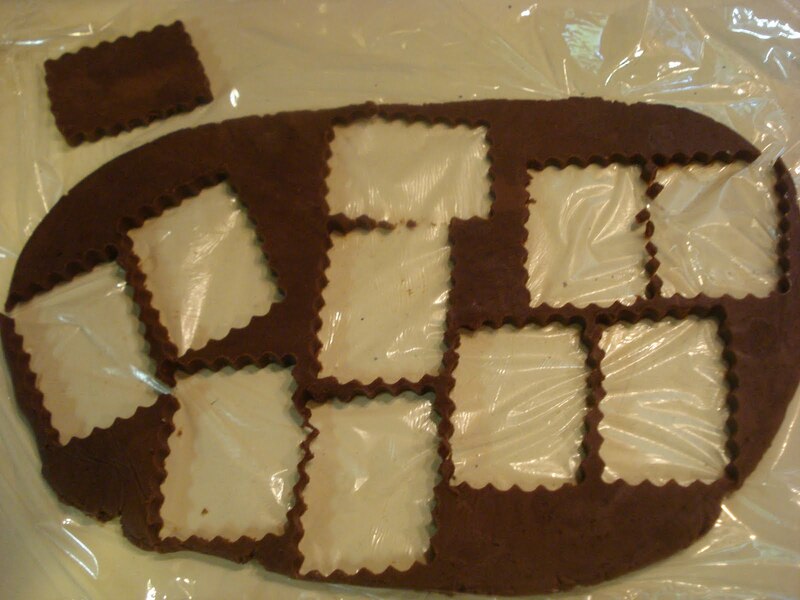 Once it's chilled, cut out your shapes and place them onto an ungreased cookie sheet. Reroll the scraps but if they get soft place them into the freezer to firm up again. Then bake for approx. 15 minutes. * Baking suggestion: It's hard to check for doneness because they are dark but the bottoms should be darker than the tops. If you're unsure, bake a few first and time them. Then let them cool completely before trying one. They should be crisp and have a nice crunch to them. Crispy and crunchy! 15 tbsp. (7.5 ozs.) unsalted butter, at cool room temp. 1. 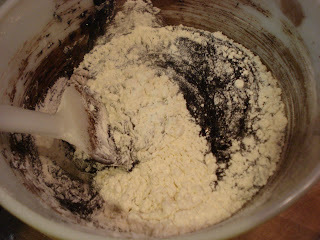 In a medium bowl, whisk together the flour, salt, ground cardamom and cocoa powder. Set aside. 2. In a mixing bowl, beat the confectioner's sugar and butter til smooth. 3. Add in the orange zest and both extracts and stir it well with a rubber spatula first, then mix with the beaters to combine. 4. With the mixer on low speed, add in the dry ingredients and mix til it's all incorporated, scraping the sides and bottom of the mixing bowl. 5. 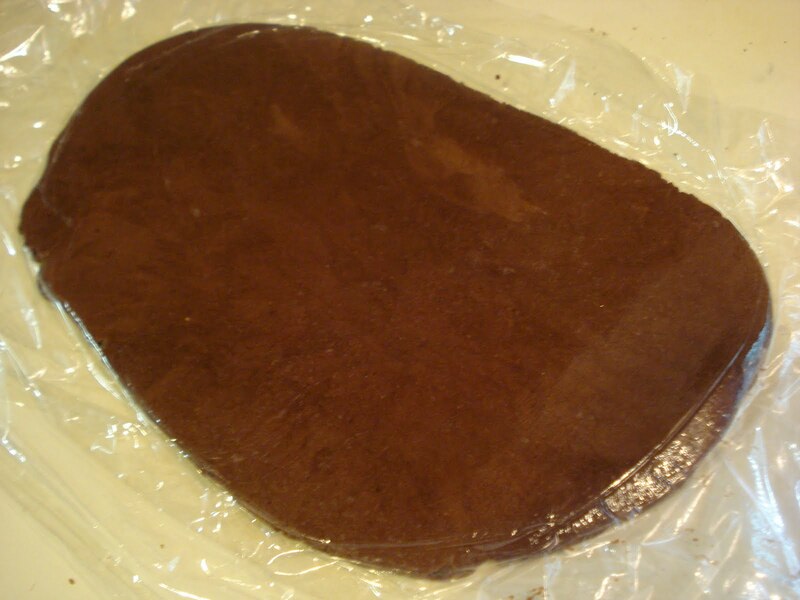 Dump the dough onto a sheet of plastic wrap and fold the wrap over the dough. Form into a rectangular shape disc, if using a rectangle cutter like I did. Or you can shape into a round shape if using a round cutter. 6. Place another piece of plastic over the dough and roll out to 1/4" - 3/8" thickness. 7. Place the dough into the fridge to firm up. 8. 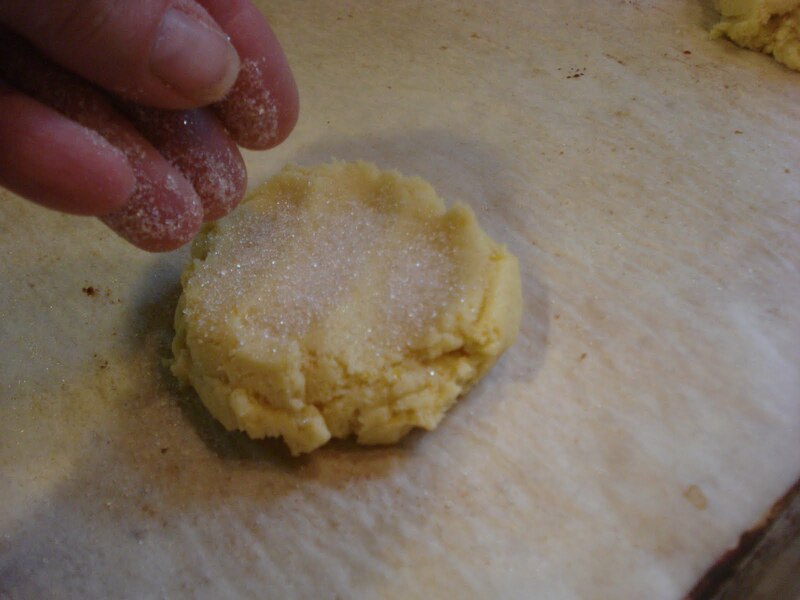 Once the dough is firm, cut out your shapes and reroll any scraps, just be sure the dough is always cold. Pop into the freezer for about 5 minutes, for a quick way to chill. 9. Bake cookies for approx. 15 minutes. ( See my suggestion above for baking). 10. Let the cookies stay on the baking sheet for about 3 minutes, then transfer to a wire rack to cool completely. The cookies store best in an air tight tin. With strawberry season winding down, I stopped at a local farm to pick up some of the last berries of the season. Some just to eat out of hand and another container to make a conserve. 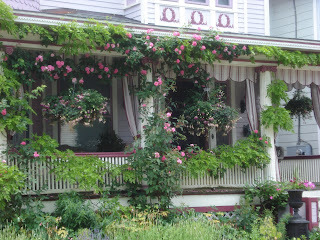 This recipe for the Strawberry Conserve is from the ladies of the "Canal House" series of cookbook. It's in the latest issue of "Bon Appetit" Magazine and because it sounded fairly simple and not the involved jam making process I was so not in the mood to make, that I decided to give it a go! I have to say it was really easy and it came out delicious, although I'm not sure if it was supposed to be more "jelled" because the syrupy part came out kind of thin but mixed in yogurt or over vanilla ice cream it is still great. But how about over crepes? Toss them into a heavy saucepan and let it sit for 2 hours. 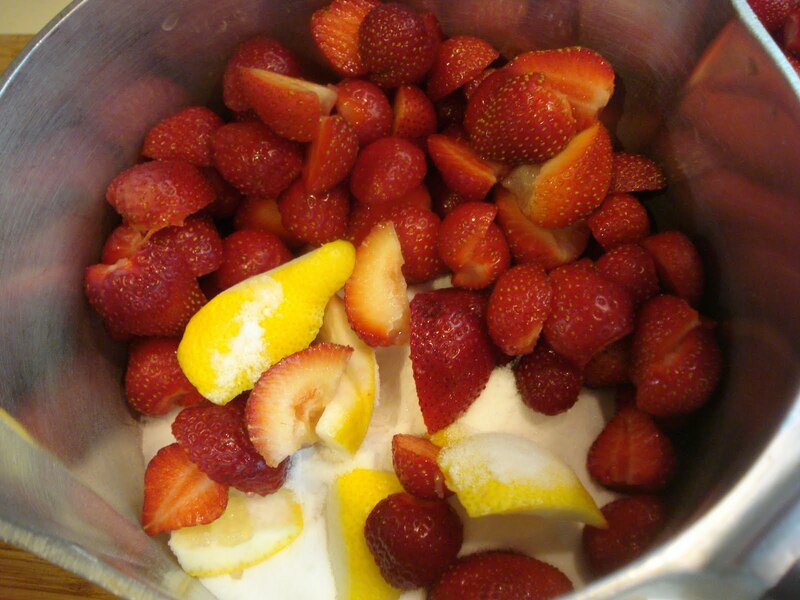 Then bring to a simmer and cook about 3 minutes, or til berries are just tender. Don't be intimidated by these. They're delicate and thin and you can actually fill them with anything you'd like-Nutella, chocolate, or anything sweet you can think of. Just top them off with whipped cream and a little powdered sugar...and, of course, the strawberry conserve. Yum! 1. Whisk together flour, sugar and salt in a medium bowl. In a small bowl, beat milk and eggs. 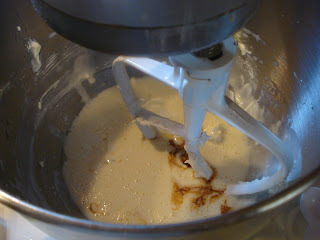 Add half the milk mixture to the dry ingredients and whisk til smooth. Add the butter and whisk til it's all combined. Whisk in the remaining milk mixture til smooth. 2. Place oil in a 12" skillet and heat over medium to low heat. Lightly whipe out the excess oil from the skillet. 3. Once the skillet is properly heated ( test with a small drop of batter first), scoop a 1/4 cup amount ( I use a ladle) into the pan and tilt and swirl the pan to coat the bottom evenly. 4. Let the crepe cook til it looks dry and the edges begin to brown slightly. ( Don't worry, you may loose the first one to testing!). This may only take 25 to 30 seconds. Gently slide a rubber spatula under the crepe and flip and cook on this side for only about 10 to 15 seconds. Then gently slide the crepe out of the pan and on to a large plate. 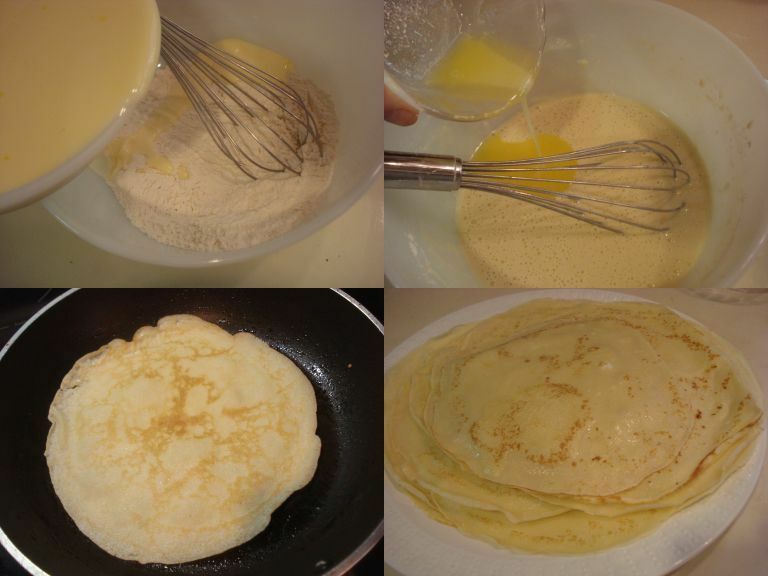 Repeat with the remaining batter, allowing the pan to heat up again for 10 seconds after each crepe is removed. Continue to stack the crepes on top of each other on the plate. 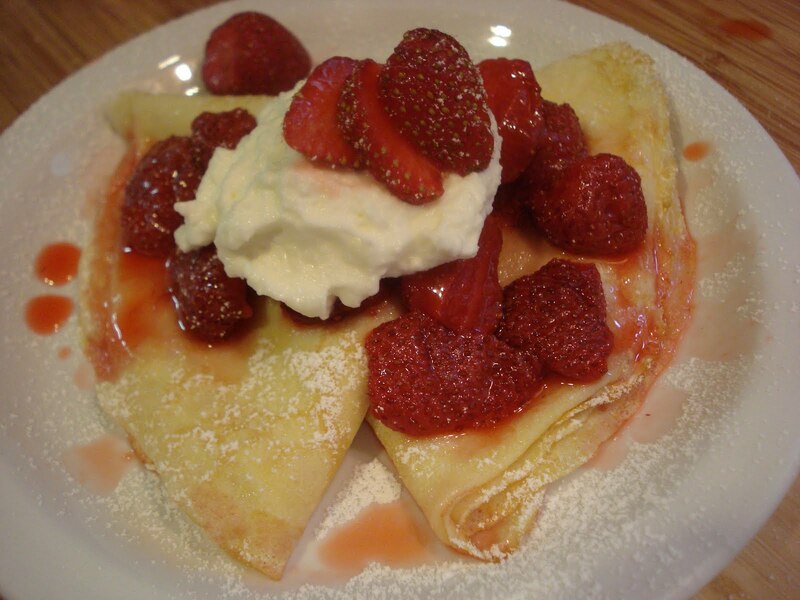 Take one or two crepes and fold them in half, then in half again and place on a pretty plate. Place a dollop of whipped cream on top and spoon some of the strawberry conserve over top, then dust with confectioners' sugar. 2. Cover and let it sit at room temperature for 2 hours. stirring occasionally. 3. 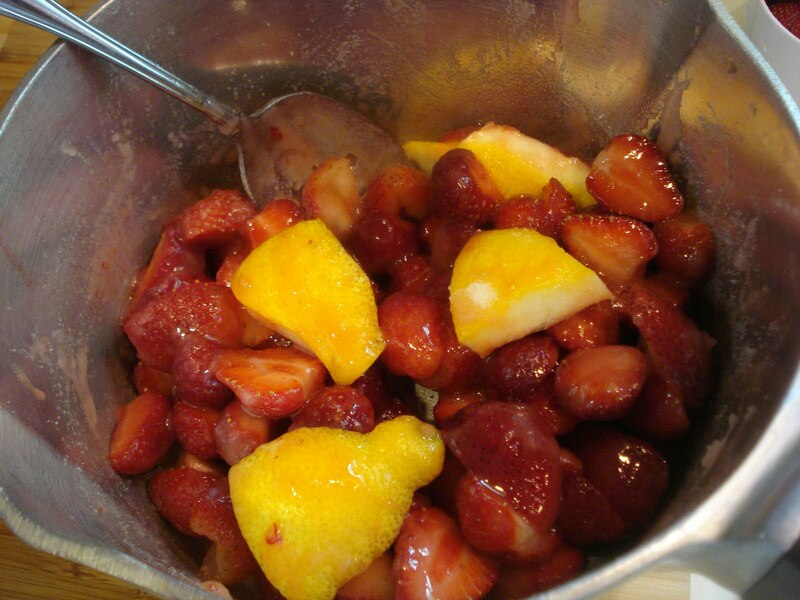 Bring the mixture to a simmer over medium heat and cook, stirring gently, til berries are just tender, about 3 minutes. 4. Using a slotted spoon, transfer berries to a one pint jar. 5. Continue simmering liquid til it thiskens into a syrupy consistency ( about 2 to 3 minutes). Discard lemon pith and pour the syrup over the berries. Let it cool to room temperature, then seal the lid and place in fridge for up to a month. 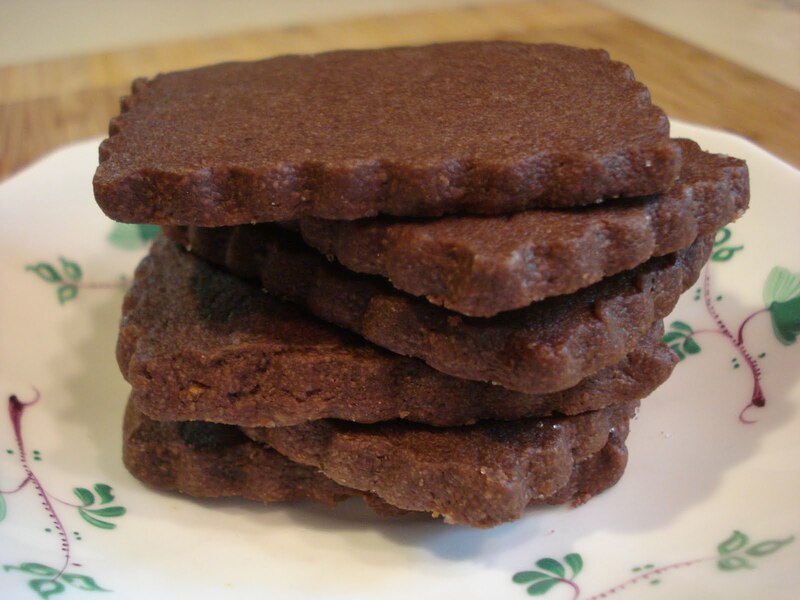 Sometimes, in the heat of this "not-yet-summer" weather you just need a cookie that doesn't include chocolate! I mean, don't get me wrong. Chocolate chips cookies are the number one fave around these parts but this one's so good, too. This cookie is thick and cakey and full of delicious orange flavor and perfect with some cool refreshing sorbet. 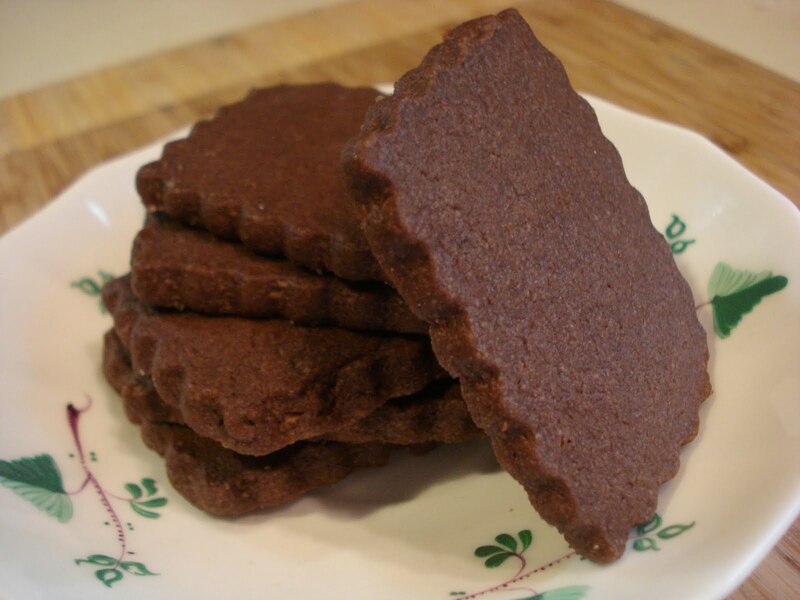 The 3 ounce cookie is big enough to share but I'm sure making these in a smaller size would work also. And with the extra egg yolks in the batter, my cookies came out with a nice golden color. Because I buy my eggs from a local egg farm, the yolks have a deeper orange color than supermarket eggs. 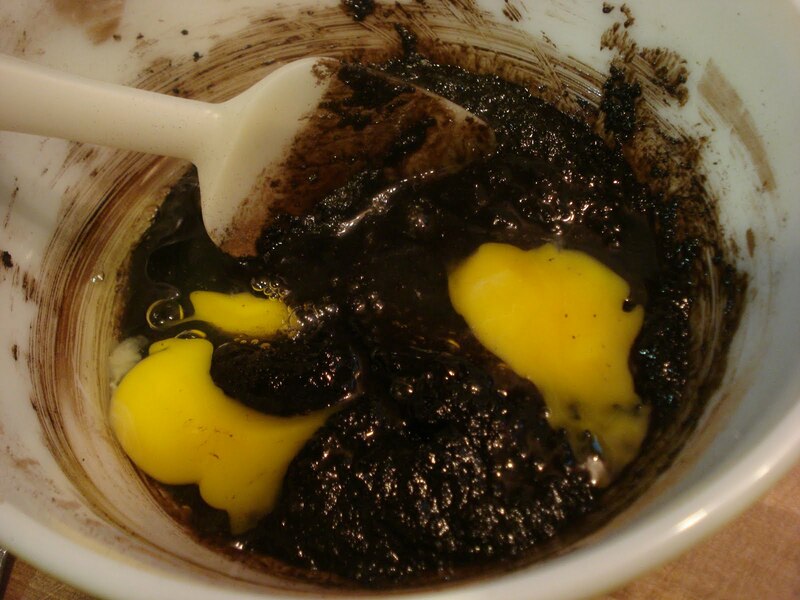 Gradually add in the eggs and egg yolks to the creamed mixture. Then add in the dry ingredients and mix just til combined. I love my scale ( I weigh everything!) and, yes, these are big cookies. Once you put them on the parchment lined baking sheets, press them firmly with your fingers, then sprinkle the tops generously with sugar and bake. Preheat oven to 350. Line 2 baking sheets with parchment paper. Position racks in bottom and top third of oven. 1. 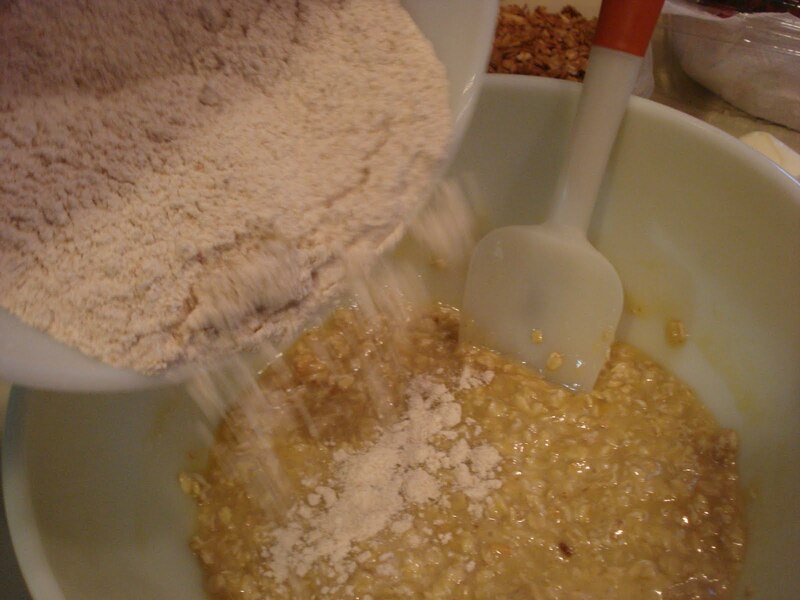 In a large bowl, whisk together the flours, baking soda and salt. Set aside. 2. 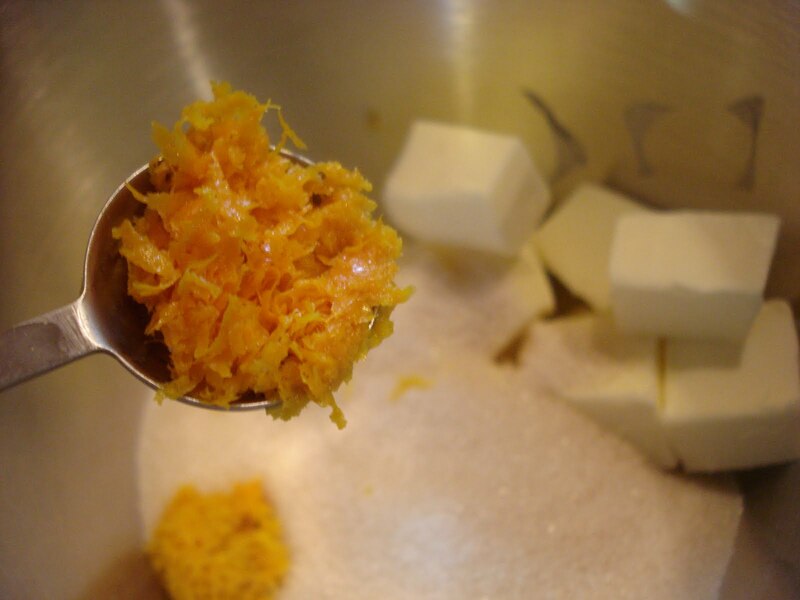 In a mixing bowl, cream the sugar, butter and orange zest together on medium speed for 2 minutes or til light and fluffy. Scrape down the bottom and sides of the bowl often. 3. 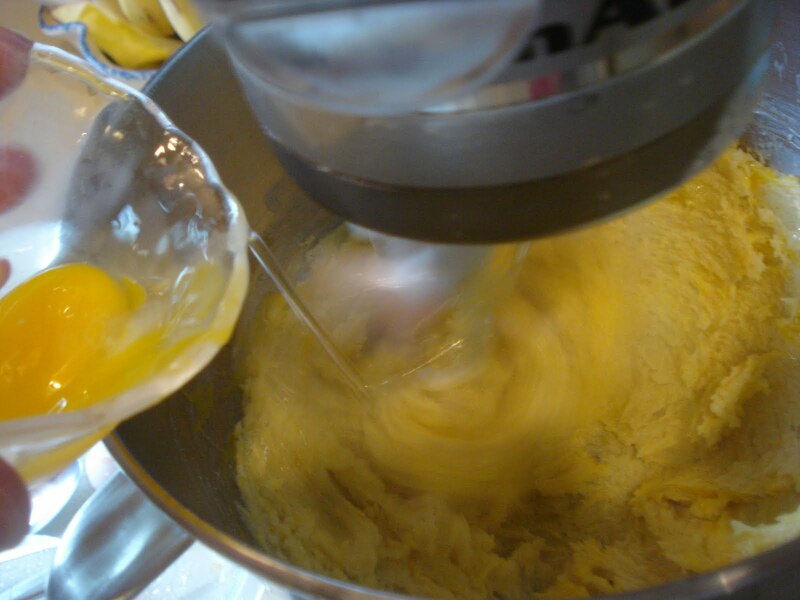 Gradually add the eggs and egg yolks, mixing on medium speed til everything is well combined. 4. 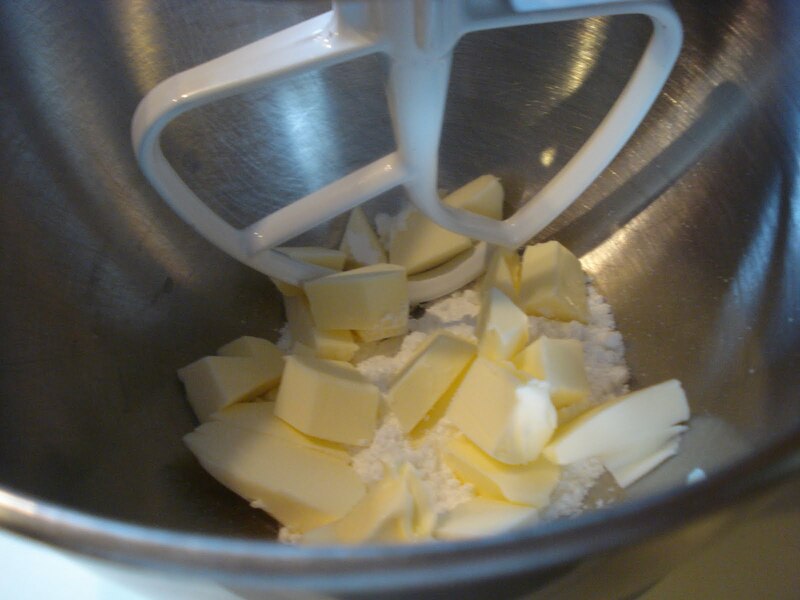 With the mixer on low speed, add the dry ingredients in stages. Mix only til everything is combined, scraping the sides and bottom of the bowl to be sure there are no pockets of dry flour remaining. 5. Using a large metal scoop, a large spoon or your clean hands, moistened with water, scoop out large balls of dough, placing 6 balls per sheet. Each ball should weigh 3 ounces. 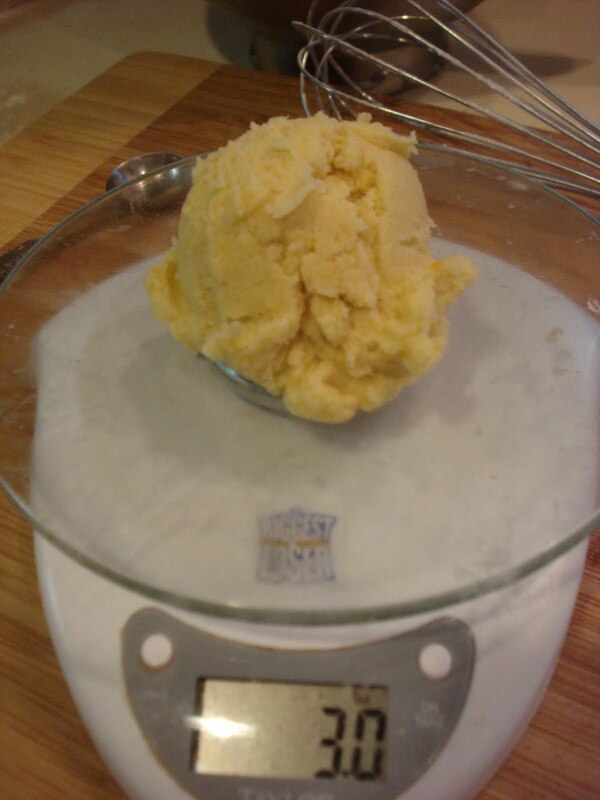 ( If you don't have a scale, the balls should be a scant 1/2 cup). 6. Press firmly on the balls, making ridges with your fingers ( for the sugar to hold) to thickness of 1/2". 7. Sprinkle, generously, the sugar on top of each cookie. 8. Bake approx. 17 minutes, rotating the sheets halfway through the baking. The cookies should be pale but baked all the way through into the center. They should be soft but careful not to underbake them or the centers will be doughy. Cool on the sheets for 5 minutes, transfer to a wire rack to cool completely. 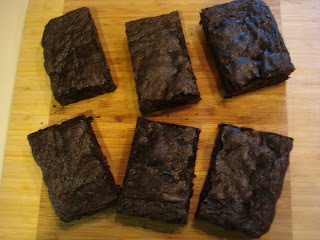 If your in the mood for a deep-dark, super dense rich brownie, then this one's for you! I found it on the back of the King Arthur Flour bag. With brownie recipes from scratch like this one being so easy ( and delicious) to make, there's no reason to buy brownie mixes...ever! As always, King Arthur recipes are great and this brownie with a big scoop of vanilla bean ice cream on top... Yum! 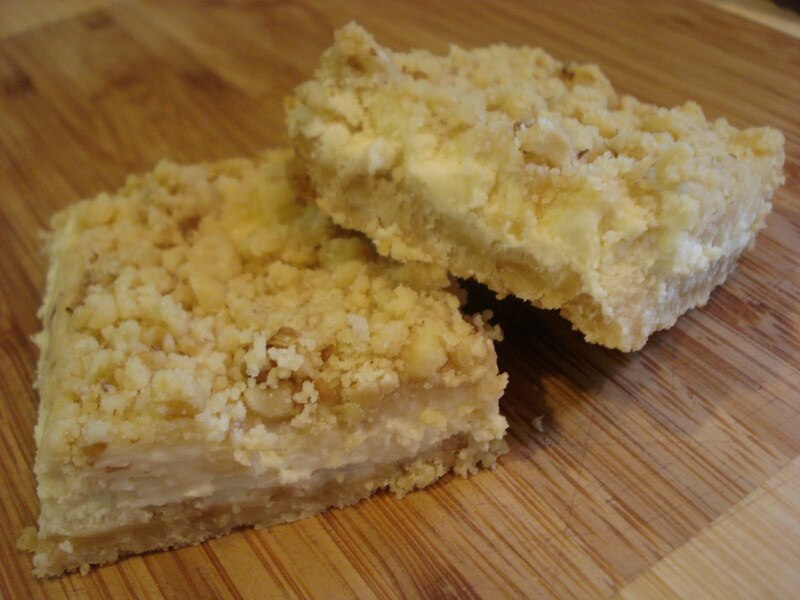 I halved the recipe and cut it into 6 rather generous size pieces but you can certainly cut the sections smaller to make 9 squares ( for half the recipe). So begin by melting the butter, then adding the sugar and heating a second time to help dissolve the sugar. This yeilds a shiny top crust. 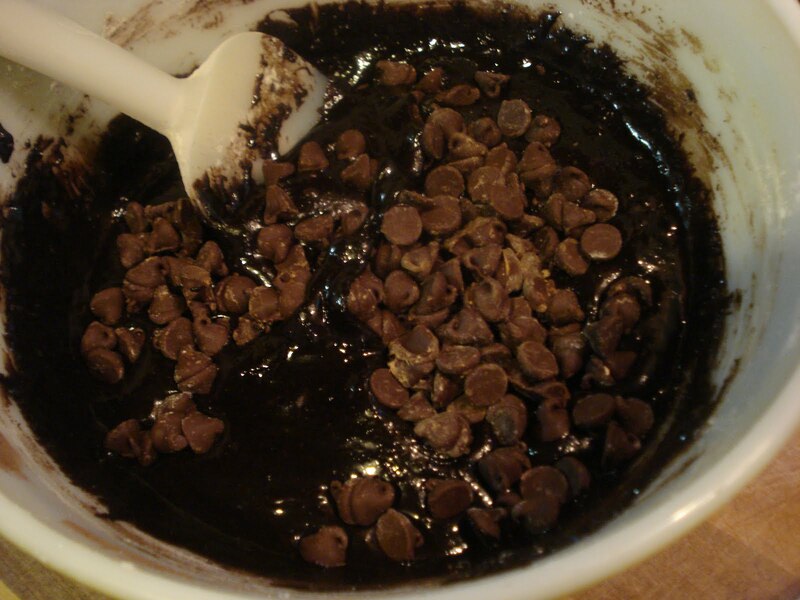 Once that's all melted together, transfer the mixture to a large mixing bowl. Then add in the cocoa, salt, baking powder and vanilla and stir that together. Mix in the eggs and beat til smooth. And chocolate chips, beating til well combined. Pour into your prepared pan and bake...that's it! Easy, quick and delicious! Preheat oven to 350. Lightly grease a 9 x 13" pan. (I didn't grease but lined my pan with foil). 1. 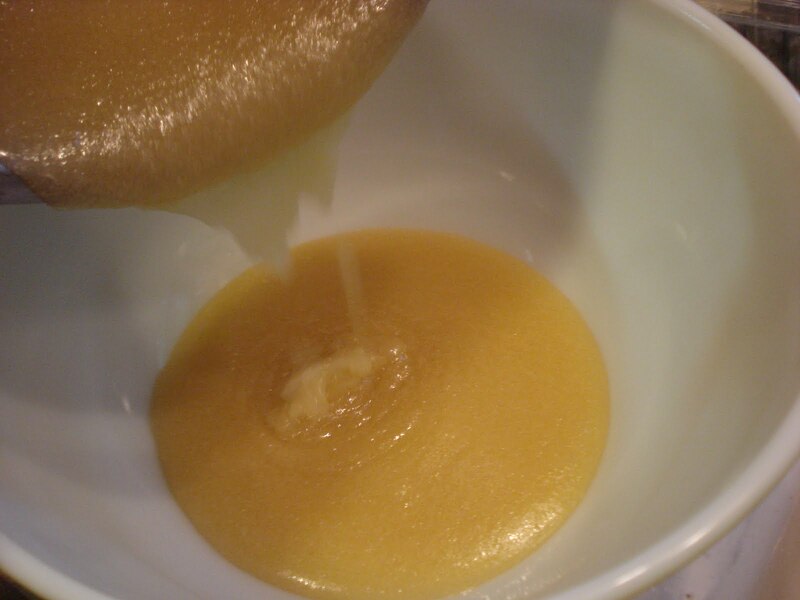 In a saucepan set over low simmering water, place the butter in a heat proof bowl, double boiler style, and melt the butter, then add the sugar and stir to combine. Return the mixture to the heat briefly, just til it's hot, but not bubbling. It will become shiny looking as you stir it. (Heating the butter and sugar a second time will dissolve more of the sugar, which yeilds a shiny top crust. Transfer the mixture to a large mixing bowl. 2. Stir in the cocoa, salt, baking powder and vanilla. 3. Add in the eggs, beating til smooth. 4. Add in the flour and chips, beating til well combined. 5. 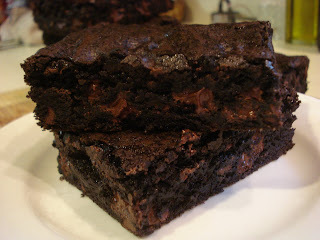 Spoon the batter into your prepared pan and bake for 28 to 30 minutes, or til a toothpick inserted into the center comes out dry ( though it may have a few moist crumbs clinging to it).The brownies should feel set on the edges and on the center. 6. Once removed from the oven, et them sit in the pan to cool down about 20 minutes before lifting out of the pan. Cool completely ( I refridgerate) before cutting into pieces. This muffin took two days to perfect! It took a bit of research to get it just right so I'm taking the liberty of calling it the best! 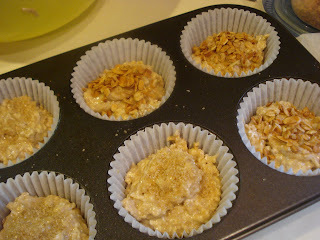 I found a Southern Living Cookbook this weekend and came upon a recipe for Oatmeal Muffins that sounded good. I proceeded to make them yesterday...but they turned out, in a word, lousy! 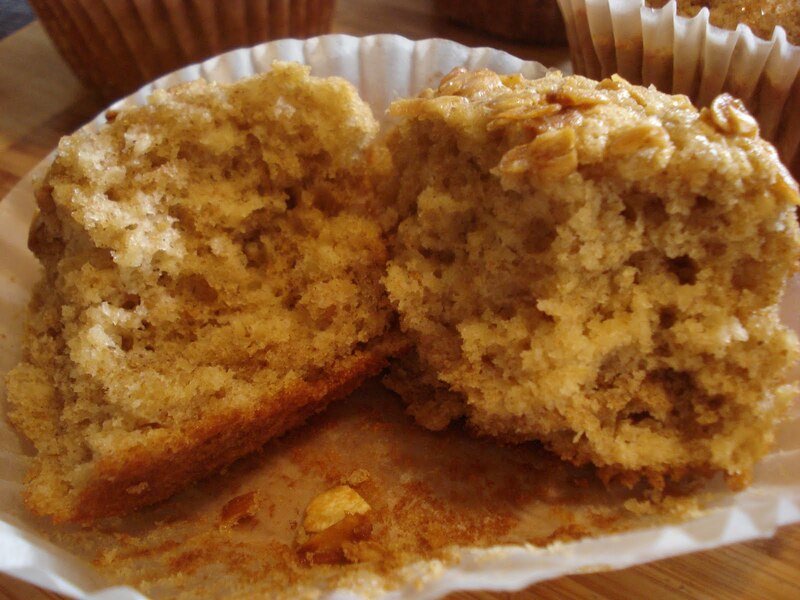 So, I looked through my trusty old Farm Journal Cookbook and, sure enough, there was a recipe for these muffins that was very different from the Southern Living one. It calls for soaking the oatmeal in buttermilk for an hour before mixing together the batter. But the book gave instructions to mix the ingredients too much, so I knew that wouldn't work. Muffin mixing is a delicate art! It requires gentle and brief mixing so the muffins don't come out tough. Ok, fast forward to today. The final muffin recipe I came up with is a light, not too sweet muffin that you can add just about anything you like. Nuts, chopped apples, granola, berries, raisins or even chocolate chips. I did swap out half the flour for some whole wheat flour...so they're even a little bit healthy! After you soak the oatmeal in the buttermilk, add the egg mixture and stir til just combined. 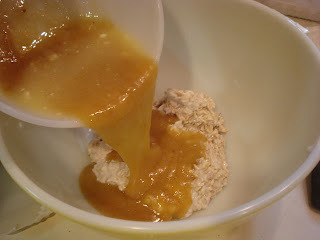 Then add the dry ingredients to the mixture and gently stir, using almost a folding motion. Don't overmix! it's okay if you still see some streaks of flour. Stop mixing! Then spoon the batter into your paper liners, sprinkle the tops with raw sugar and either some oats or some granola ( my choice). 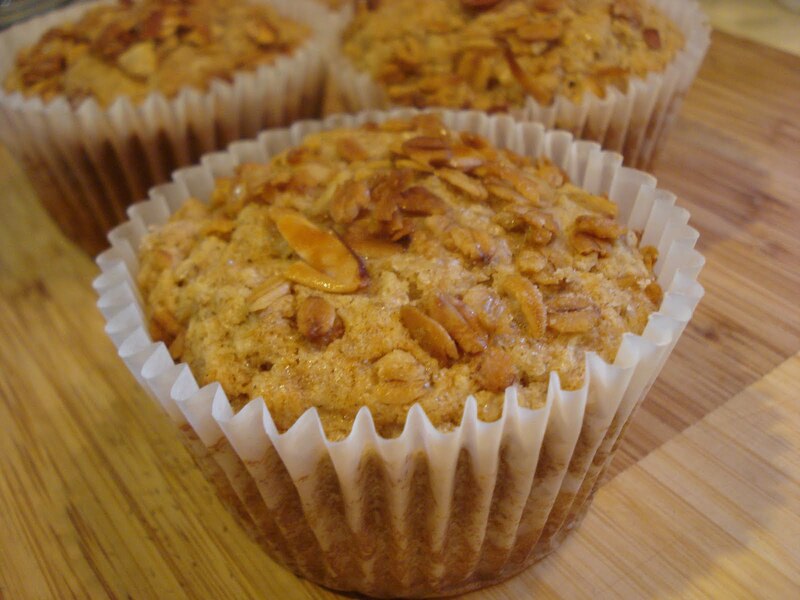 I baked 6 jumbo muffins but you can make them the standard size and get 12. ( And, yes, I sprinkled half with granola and half without!). Makes 12 standard size muffins or 6 jumbo. Raw or turbinado sugar ( for sprinkling on top),opt. Oats or granola (for sprinkling on top),opt. 1. Combine oats and buttermilk in a small bowl. Stir and let it sit for an hour. 2. After an hour, preheat oven to 375. 3. Whisk together flour(s), baking powder, baking soda, cinnamon and salt. 4. 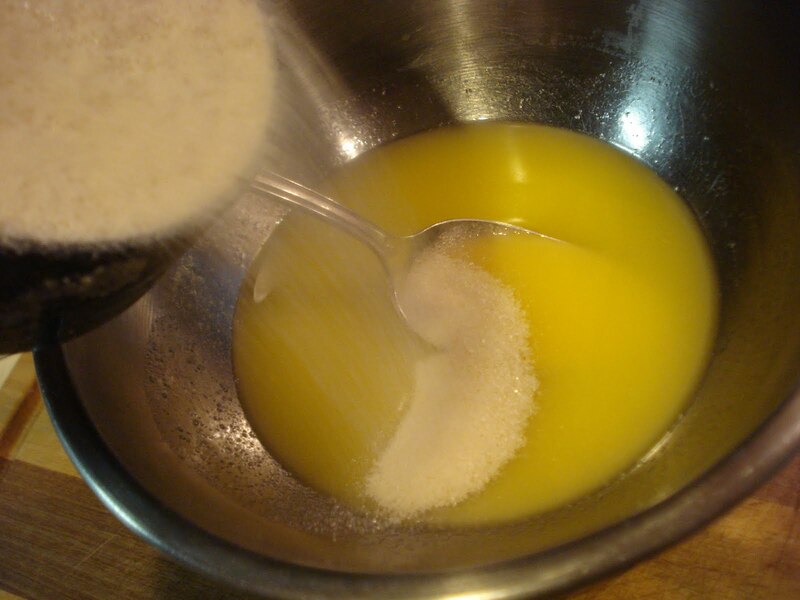 In a small bowl, whisk together the butter, oil, sugar, egg and vanilla. 5. Add the butter/egg mixture to the oatmeal/buttermilk mixture and stir just to combine. 6. 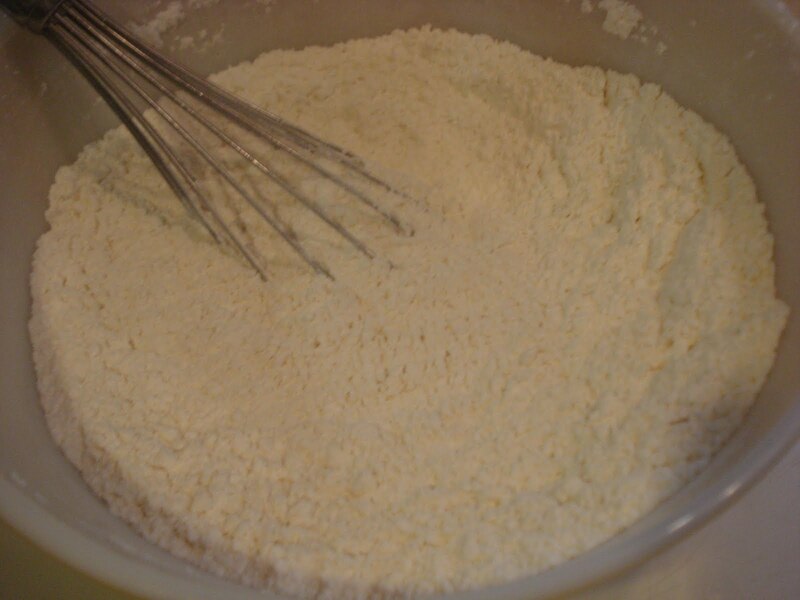 Add in the flour mixture and stir gently, just til combined but streaks of flour may remain. Don't overmix! 7. Briefly fold in any add-ins that you want. Again, being careful not to overmix. 8. Sprinkle the tops with the raw sugar and/or granola or oats. 9. Bake for 15 to 20 minutes, or just til tester comes out clean. Don't overbake. 10. Cool in pan 5 minutes, then take out of pan and cool slightly. 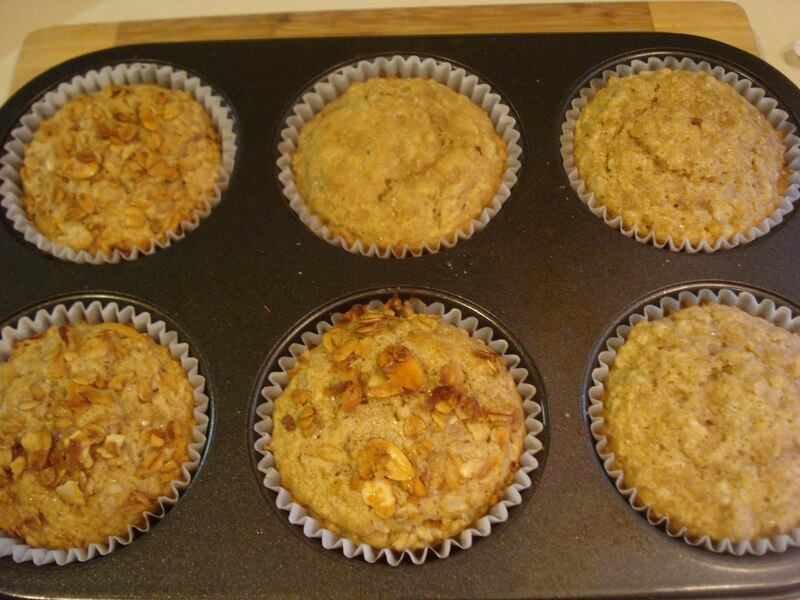 These muffins are so good warm! A Weekend Out of the Kitchen! 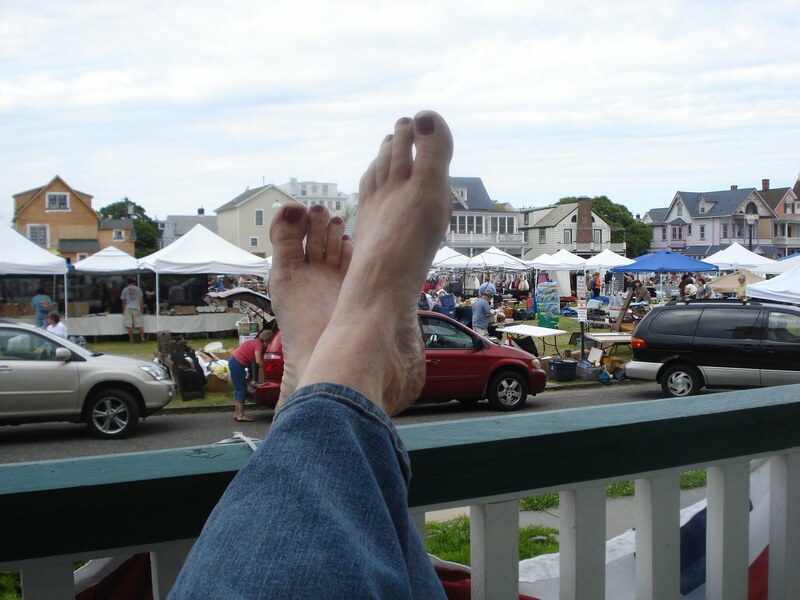 I had the chance to get out of the kitchen and go down the shore this weekend for a giant flea market that was being held in Ocean Grove, NJ. 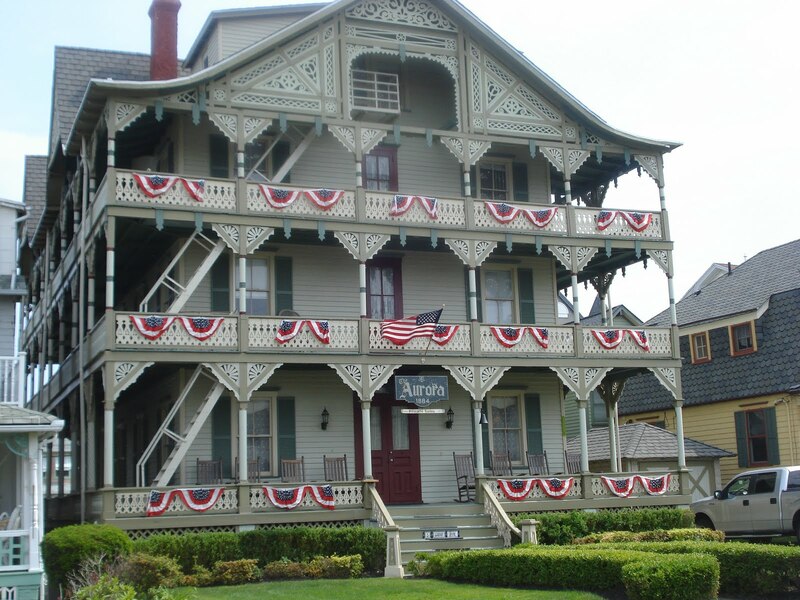 If you've never heard of Ocean Grove, it's a wonderful little "gem" of a town that lies just south of Asbury Park..you know, the one where this guy got his start here! 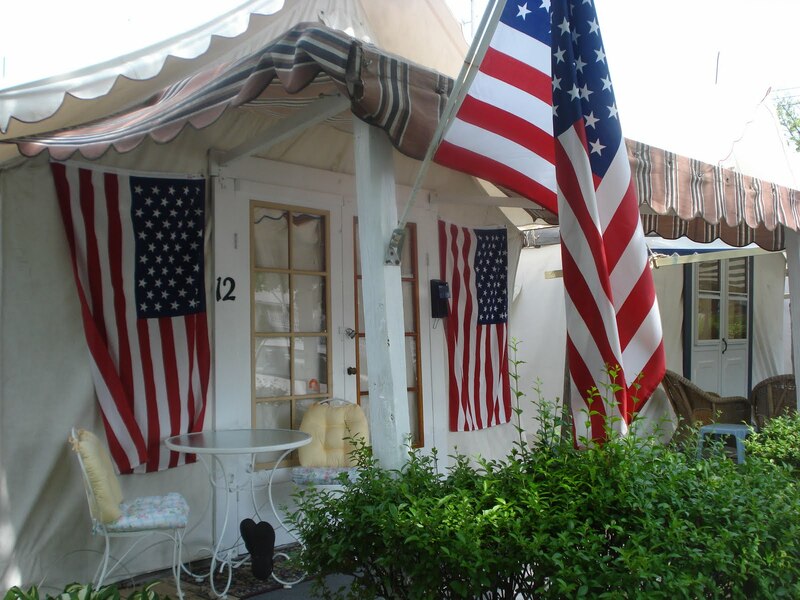 It's filled with charming Victorian houses and really a wonderful place to get away for a weekend. 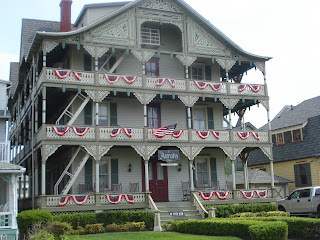 Having spent part of my growing up years living down the shore, I had visited Ocean Grove only maybe once or twice so after all these years it seemed like I was seeing it for the first time. It originally was a religious summer resort retreat and I remember you weren't even allowed to drive a car there on Sundays. 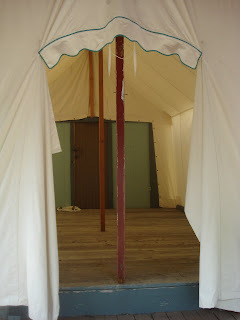 What I find fascinating are the tents set up all summer. They're made of a heavy canvas that attaches to a permanent structure in the back. 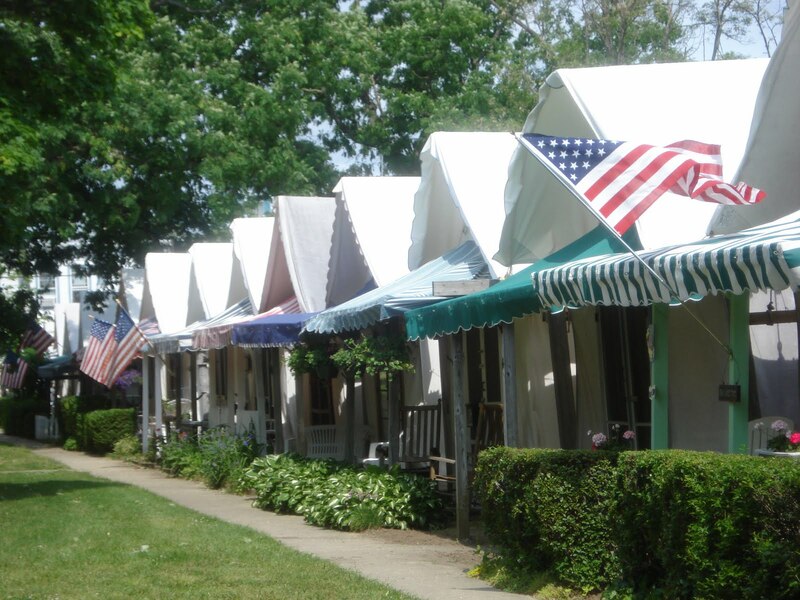 There are several streets of these tents set up around the Great Auditorium and they are so charming! You can see the inside of one here. Just a wooden platform floor with the top propped up in place. And, of course, no shortage of Victorian architecture with wrap around porches and an abundance of blooming flowers everywhere. So pretty! The gingerbread trim on the houses is amazing. Wouldn't want to paint all that! So, it was great to get a break from baking. I'm already planning my next mini vacation. Hmmm...wonder where I can go next? We're not big cheesecake lovers in this household so there's a good chance you'll never see a recipe for anything too cheesecakey(?) on this blog. But when I came across this recipe for cream cheese bars they really sounded good. 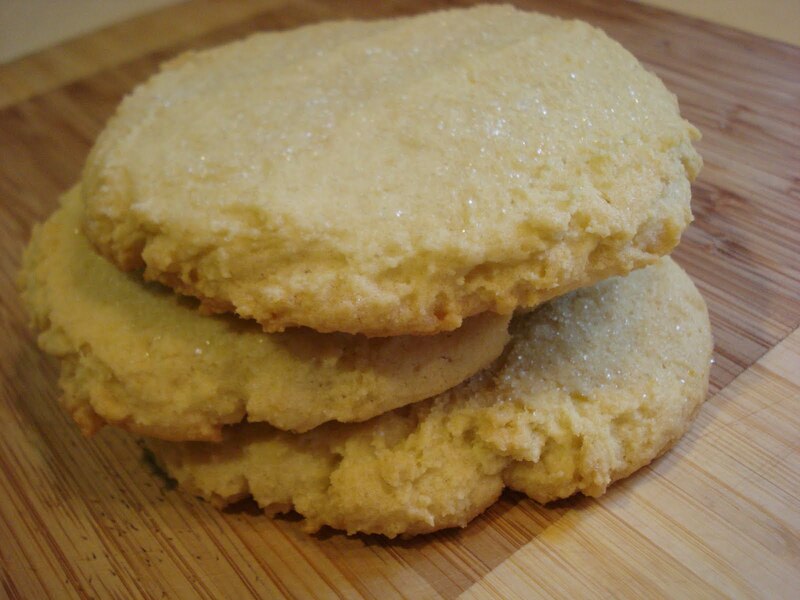 They're light, not too sweet with a light lemony flavor. A kind of refreshing dessert for this awful hot weather we've been having. And they are quick and easy to make...again, perfect for a hot day in my non-airconditioned kitchen! 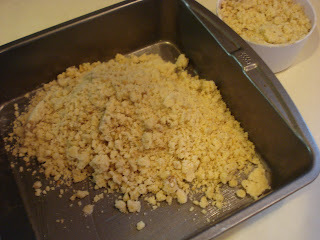 First make the crust by creaming the butter and brown sugar, then adding in the flour and walnuts. Save a cupful for the topping, then press the remainder into your 8" square pan. While the crust is baking, make the filling by beating the cream cheese, gradually adding in the sugar, egg, milk, lemon juice and vanilla. Then take the crust out of the oven and pour the filling over top. Sprinkle the remaining crust mixture over that and bake again for 25 minutes. Keep chilled, once set, in the fridge. Preheat oven to 350. Butter lightly an 8" square pan. 2. Stir in flour and chopped walnuts, mixing til crumbly. Remove 1 cup of mixture and reserve for topping. 3. Press remaining mixture into bottom of prepared pan and bake for 12 minutes, or til golden brown. 4. 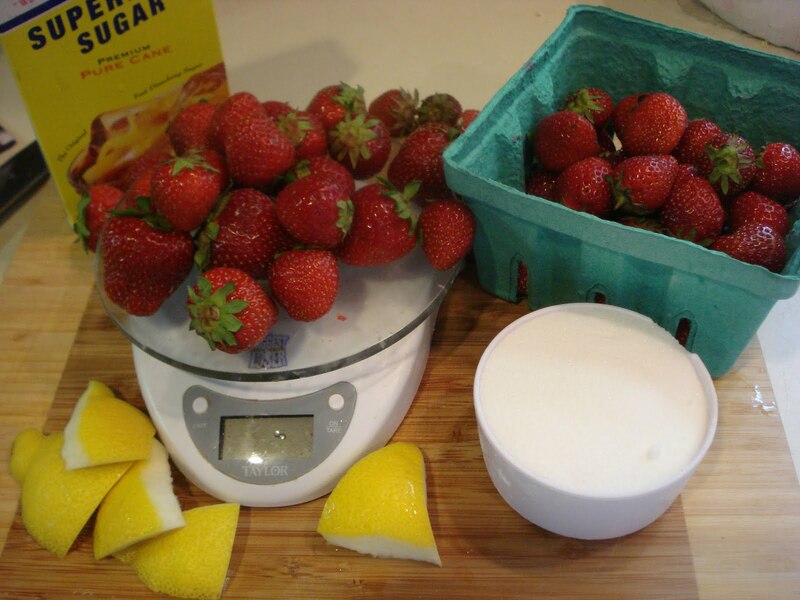 Meanwhile, beat cream cheese til smooth, gradually adding sugar, egg, milk, lemon juice, lemon zest and vanilla, beating well. 5. 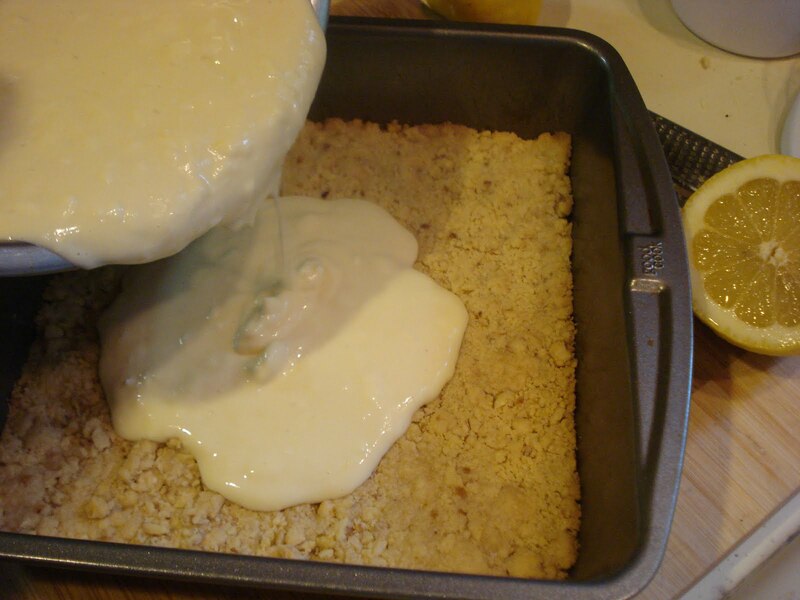 Spread cream cheese mixture over baked crust, then sprinkle the top with remaining crust mixture. 6. Bake for 25 minutes, or til set. 7. Cool in pan on rack. Store in fridge. Cut when cool into 2" squares.